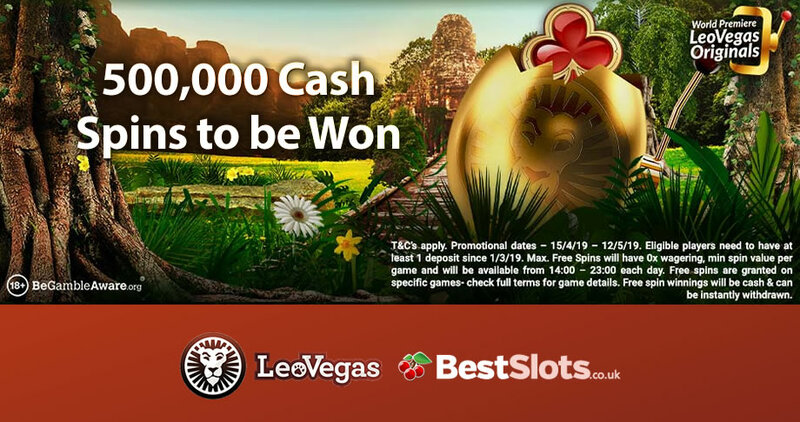 Cash spins and plenty of them are up for grabs at LeoVegas Casino over the next few weeks thanks to their massive Easter Spin Party giveaway. Every day between now and the 12th of May (2019), 250 lucky players will be awarded between 50 and 100 cash spins. That’s 18,000 free spins per day or 128,000 per week. Add the whole lot together and the prize pool comes to a whopping 500,000 cash spins! To be in with a chance of winning a share, you’ll need to have made a cash deposit since the 1st of March (2019) – more info below if you’re a new player. Anyway, then make sure that you’ve selected ‘Yes to Communications’ in your profile setting. A random prize drop will then take place with 250 lucky winners getting the following cash spin packages every day. Go to the My Offers page any time after 2pm to see if you’re one of the day’s lucky winners. You’ll have 8 hours to claim your cash spins after they’ve been added so check regularly. Once claimed, you’ll have 3 days to use them. The action gets under way on Swipe & Roll, 5 reel, 20 payline slot game from Net Entertainment. The setting here is swinging 60s-era casino. The theme might be a little on the vintage side but there are plenty of fresh features to get stuck into. Extras here include multiplier wilds that can boost payouts by up to 3x, re-spins with sticky wilds and a pair of spin the wheel bonus features. Head on over to LeoVegas Casino and you could get the holidays off to a flying start. New players are eligible for 20 no-deposit required free spins. There are also deposit bonuses worth up to £400 and another 100 bonus spins on offer in the welcome page on Book of Dead. That’s a total of 120 Book of Dead bonus spins and £400 in bonuses up for grabs.